The Quirinn Clan came to the continent centuries ago as diplomats, and over generations their culture has been diluted - currently, their system is a mishmash of dragonborn traditions and civilised systems. They have an unusual custom as they do not get married and have many children with one partner in the typical sense. Instead, potential partners will offer up great wealth, land, and power in return for the honour of becoming king or queen. They will remain in the royal court until the child is 3 years old and healthy, after which the partner is either executed or, more commonly in recent years, exiled. The remaining parent and child will take their clan name, partially as a show of power, partially as an act of respect. 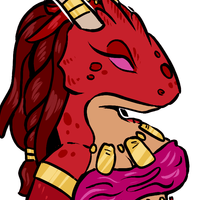 Quirinn is tall and well-built, her scales are a deep red but glimmer gold in certain lights, and her snout and features are more pronounced than the average dragonborn, but her scales are a lot smoother. The horns on the back of her head are long and dark, and fashioned more like human hair. Despite her brute size, her mannerisms are quite humanoid and delicate, she is mildly molysmophobic and tends to use magic to touch unfamiliar objects, but can get past this in dire situations. She wears revealing, purple robes accented with red and gold, alongside a thick cape in colder climates, though the cold doesn’t tend to bother her too much. All her fabrics are made from fireproof materials, which all lend themselves to looking shiny and expensive. Her wrists, neck and horns are adorned with gold jewellery. Most notable is a necklace with 3 pendants, representing each of her children. Despite living and growing up in the lap of luxury, Quirinn wasn't soft - her mother made it clear from a young age what was expected of her, and that was to be a strong and worthy heir, and to produce many children as soon as possible. She was educated well but had little interest in learning so most of this knowledge was abandoned. Although physically strong, this didn't translate into capacity in fighting, and Quirinn disliked physical contact - instead, she practiced magic as a form of self-defence. 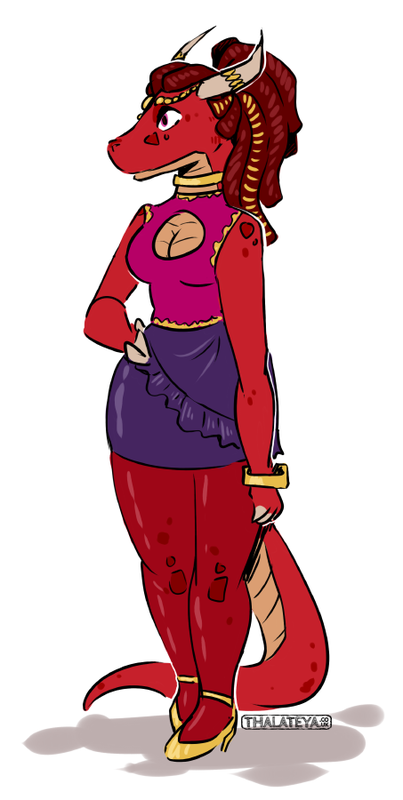 One of her proudest traits is her draconic lineage, all her family have access to powers inherited by their gold-dragon ancestors, but most do not have the dedication or desire to focus their magic in order to unlock these powers. Over the years, she has had three partners, who were all killed after their children matured, as per the family tradition. The last of these partners prompted some controversy as she was accused of having an affair with his brother - to this day, it is uncertain which brother is the child's real father. Quirinn has a close relationship with her children although her eldest is friendlier with his uncle - while keeping it professional in the public eye, Quirinn is very maternal and sensitive in private. As her children matured, Quirinn began to focus more on personal ambitions and her magic. She gained an interest in collecting and studying magical artefacts, and was more dedicated to enriching her own magical abilities, knowing that this would be harder after she was Queen. She travelled across the country under the guise of royal visits, at all times accompanied by a hand-chosen court to entertain, care for and protect her - to her, this was living out in the wild. Sometimes, she envied the freedom of adventurers, ready to travel and fight without the burden of responsibility, though she would never admit it. This came crashing to a halt one day, as she was attacked by bandits when travelling home. They ransacked anything of value bar the clothes on her back, and murdered or fatally injured almost everybody before fleeing. Many of these people Quirinn had known for a good chunk of her life, and she feels guilty for their deaths, but retains her noble poise and doesn’t let this affect her. The only other survivor of the attack was one of the newest members of her court, a Tiefling bard who she had become very fond of. She promised a generous sum of money in return for their continued servitude, partially so that she had somebody to protect her, but mostly so she just wasn't alone. Quirinn speaks with a very distinct accent. 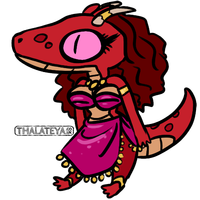 It isn't actually a 'dragonic' accent, but instead a royal dialect accociated with the royal family and nobles, and she was taught to talk that way as it was considered proper. She can speak 'normally' if so inclined. Quirinn has a dendency to drink when she's depressed or emotional, and when she's drunk is less likey to withold her emotions. Her court could've told stories of Quirinn drunk, stumbling thoughout the building, usually shouting at people, and trying in vain to return her to her room before anybody significant saw her. One of her Courtiers had a severe burn along his arm from one of these incidents - be was actually very chill about it and usually told the story of it, much to Quirinn's embarresment. There are many rumors about Quruinn. One is that one of her horns was broken as a child, and to this day the tip is a replacement. It's not very noticable due to how much jewellery she wears. Secondly, sometime after the death of her second husband, Quirinn was spotted wearing disguises and visiting brothels. She was noted to fraternize with a young green dragonborn girl a lot, until she vanished. Many people belive this girl was a mistress, and was killed because she was found out. Finally, it's belived that the family has a large gallery of priceless magical heirlooms within the castle. Quirinn will neither accept nor deny any of these. Quirinn's homeland is home to many exotic fruits, but she finds the texture too strange and the taste sickeningly sweet. However, once the meat population of the islands was swept over by disease, causing many animals to be killed and a vas meat shortage. Obviously, the only really hurt the poorer poulations, but Quirinn was pregnant with her first son and reluctant to eat any possiby-tained meat, meaning she had to surive for a couple months only on preseved meats and fruits. It was horrible. The colour of a dragonborn's scales is important not only biologically, but how they act and how they are viewed. 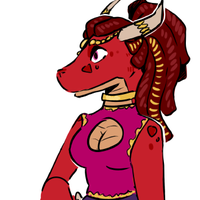 Qurinn and most of her family are red dragons (the only exception being her eldest son) but this is a fairy recent development - historically the family has always been lead by a gold dragon. Quirinn's grandfather was a gold dragonborn, he was offed with only one heir, a red dragonborn, who is the current Queen, Harann. 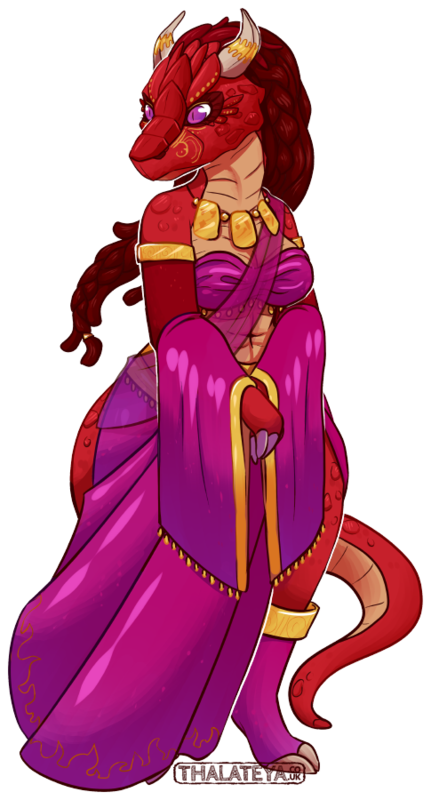 Harann is disgusted by her own heritage, and was dissapointed when both her children turned out red - it was her influence that helped Quirinn meet her first husband, a gold dragonborn, as it meant that the royal line would return to being gold. It's worth noting that gold dragonborn are one of the rarest colours, at least in the kingdom, where any gold dragonborn can usually be traced back to the royal family within a few generations. Heck, even Quirinn's first husband was belived to be a distant cousin of hers. Also, because of the long heritage of gold dragonborn, Quirinn's socery powers are actually based on gold, not red, dragons - even though they're basically the same. Traditional Quirinn family colours are red and purple - if you don't have gold scales, gold should be used as a prolific accent colour. Quirinn's family has a long history of magic, with some of the earliet decendants being fine gold dragonborn sorcerers who won over their people with sheer power (or at least, that's how the story goes). Every member has inherited some of their power, but few are interested in learning more than a few basic, traditional spells. As a child, Quirinn learned a few basic self-defence moves, but her interest in magic was increasignly prominent as she matured. What little spare time she had was spent dedicated to learning magic, cementing her as a sorceress like her ancestors before her. Interestingly, her brother Frojhan had a distinct interest in weaponry and trained as a millitary leader. Quirinn likes to joke that she 'taught frostbite how to fight', referring to how she taught him what self defence she knew as a child, though obviously he now very much exceeds her. Frojhan and Quirinn almost mirror eachother with their respective abilities. As a child, Qurinn had a strict sleep shedule, and would often turn into a log when the night came. As she got older and took over more of her mother's responsibilites, a sleep shedule became an alien concept, and she usually just slept whenever she had a few hours free, day or night. This helped her well when she travelled off on her own and sleeping became more of a luxury. What she was not prepared for was the awful places she woud be sleeping, and she gets especially homesick at night. Recent events have caused her to get even less sleep, as she often lies awake or suffers from night terrors, but she still has enough rest to get by. Most dragonborn's horns are worn down by daily wear and toil. Dragonborn royalty however, being above such things, shapes their horns using a variety of tools. Delicate, sharp and eloquent horns are considered signs of immense wealth. Many royal dragonborn even carve patterns into their horns (Quirinn included). [ Mother ] The son of King Orjin Quirinn, who was an exceptional case as he chose to marry a commoner for love rather than money, and refused to kill her when Harann was 3. Everybody was expecting Harann to take after her mother, but this was proved wrong shortly after her father's death when she was 12 - she executed her own surviving mother and all her relatives, violently believing that her father had soiled the family legacy. [ 1st Son ] The eldest of Quirinn's children and a strong yet sensitive soul. He is a handsome golden dragonborn who resembles a shorter, slender version of his mother. Quirinn was still only a teenager when wedded to Priskan's father, Savull, and she fell quickly in love with him due to childish naivete and ignorance. Despite initial complications, Savull was born healthy and survived to his father's execution. Growing up he was smothered by Quirinn's love and saw first-hand the pain she felt at the death of her husbands. This soon caused him to oppose the traditions of the family and has been the first one in the family in three generations to speak against it. However, he was still a child at the time, and hardly taken seriously - threats from his grandmother quickly caused him to stop. As he got older, he started to bond with his uncle Frojhan, admiring his martial powers. While Quirinn was busy with royal matters and the younger children, Frojhan trained as an apprentice of sorts to Frojhan, although eventually his duties in preparation as a future king took priority. Eventually he met Soyassa, a blue dragonborn from a middling class family, and they were wed despite opposition from both families. Despite being married for a few years they've yet to have a child as he doesn’t want to face the prospect of killing her, nor facing his grandmother with this explanation. The Queen is somewhat suspicious of this but has yet to pry, Quirinn is pretty much obvious to everything. 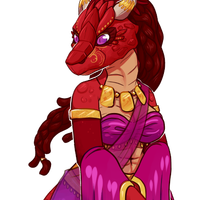 [ Daughter ] The middle child, Quipora is a half-dragonborn - and considered a very beautiful one to anybody who's into that. She has long, black hair and skin that transitions to reddish scales and claws, and horns like her mother. Quirinn's marriage to Quipora's father, Erran, was solely do to their family's wealth. While marriages to humans in the royal family were not unheard of, it was typically not somebody as significant as the future queen. Their marriage was devoid of love and he only married her due to pressure from his family. 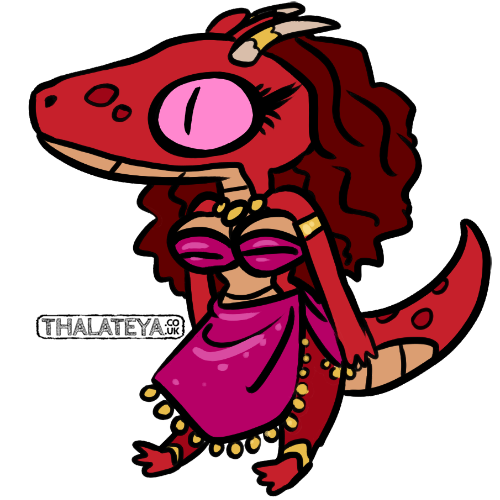 Quipora's birth had several complications, many nurses were unsure if she would make it or what they had to do, simply due to the rarity of her species and how she would turn out. Fortunately, they had the best nurses on hand and worked out how best to care for her. Quipora's birth drew her parents closer together and, while Quirinn didn’t love him intensely as Savull, she was heartbroken at his death. Quipora was noted to not shed a single tear when she watched her father's death, even said to be smiling. She often travelled abroad to visit different collages to hone her craft and meet new people to employ the palace. Her favourite was the Bard's College in Fleut, which also happens to be where she met Chant - she offered Chant a journey to her homeland and employment amongst royalty. Quirinn took a fancy to Chant, and they were eventually promoted to work as her personal bard. [ 2nd Son ] It was some time before Quirinn would remarry. 'The Baharoosh Boys' were a pair of carpenters who frequently worked with the royal family, consisting of the older Padaar (a dark red dragonborn) and the younger Rhozire (a black dragonborn). The family business was growing strong, with Rhozire's children appearing to take after their father and many apprentices vying for jobs. Quirinn's engagement to Padaar was intended as a sort of 'Royal Seal', advertising the business that would in turn profit the royal family. However, shortly after their marriage Quirinn began developing feelings for Rhozire, and he felt the same way since the death of his wife, and eventually they started spending more time together than Quirinn and Padaar. When the public found out, there was outrage, and when Quirinn announced her pregnancy it was unclear which brother was the father. Girgil's birth was somewhat traumatic, he was born premature and the baby's health was uncertain. The nurses decided it would be best if Quirinn didn't have any more children, which she reluctantly accepted knowing that three children would be more than sufficient to bring the kingdom into the next generation. The boy's scales were a dark red, almost perfectly matching Padaar's scales, seemingly ending the debate of his heritage. Despite many health problems early on, Girgil got to witness his father's death. It was after that that his 'mature' scales started coming in... possessing a darker purply hue more commonly associated with black dragons. It wasn't long before the public was furious and demanding that Rhozire was sentenced to death just like his brother and claiming that Girgil was not a legitimate member of the throne. The Queen, however, stood by her grandson, and refuted any claims, but still agreed that Rhozire should be sentenced. As soon as this news got out, Rhozire vanished, leaving a private note to Quirinn that, despite his love for her, he didn't want to die and had fled the country. This was baffling to her - somebody would rather life their life in fear and shame than die with honour. Regardless, Rhozire was hunted down on Quirinn's command. A few months later it was announced that Rhozire had been found and killed on sight, but with no body as proof it was debatable. Either way, if he ever showed his face before Quirinn again, it would be promptly burnt off. Despite all the drama surrounding his birth, and all the health issues growing up, Girgil is a happy and smart individual, if a bit on the small side. Currently he is a little too young to decide what to do with himself and is still smothered by the family as if he was a child, and prone to childish tendencies (he collects rocks, gives them all names and plays pretend, etc). His 'cousins' are keen on teaching him carpentry so that he can follow the family tree on his father's side. [ Brother ] Quirinn's younger brother, and fifth in line for the throne - rather than waste his time with royal pursuits, he dedicated himself to the military and the royal guard, and has since grown to be a formidable commander.